Inspiring Thoughts Blog gives you hot tips, cheats and shortcuts to solving problems and developing new perspectives on life and everyday living that result in positive change for all who participate. 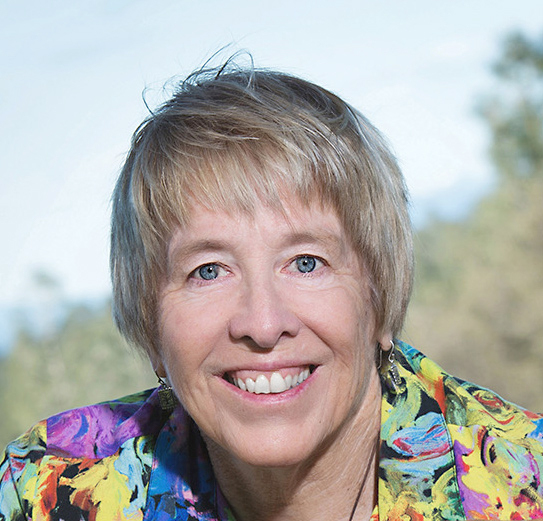 marge perry, owner of inspire hypnosis in redding, ca and author of inspiring thoughts blog. While everyone wants the "good life", many of us are held back by self-defeating thoughts and habits. The thoughts we think influence our behavior and actions—which can make life a rewarding adventure or endlessly mundane drudgery. Your Inspiring Thoughts Blog gives you tips, cheats, and paradigm shifts to help you solve problems and develop new perspectives that give you a shortcut to living a better life now. Consider this your RESULTS TOOLBOX. When it comes to food, what is your inner dialogue? Every thought creates an emotion. Your emotions fuel your decisions. And your decisions are what put the calories into your body. So, it is not just about carbs, fat grams and calories – it is about your beliefs, attitudes, and emotions. Change your thoughts, attitudes, and limiting beliefs in your mind first to change your body. The easiest, most effective and most enjoyable way to succeed is Hypnosis. Unlock Your Mind — Be Free! Are you living the life you want, Or living in a self-imposed prison? Are you living in a self-imposed prison? Many of us go through life living within a small limited cell where we expose ourselves to a steady stream of fear, guilt, shame and resentments. The prison is our own mind and we hold the key to freedom and a happier more fulfilling life. Think for a moment about something you have really wanted to do; perhaps you have tried and gave up, talked yourself out of it, or just never got around to doing it. For example, let’s say you wanted to be “x” pounds so you could take the pressure off your joints, get off your blood pressure medications and have more energy and confidence to go dancing. What kept you from reaching and maintaining that weight and lifestyle? NEGATIVE THOUGHTS… such as “I can’t stick to a diet,” “I don’t have the time,” “It might cost me too much money,” “I might fail again.” These sorts of thoughts are your jailers…the ones that keep you confined. Negative thoughts keep you in a mindset that limits your possibilities and success. How do you get released from prison? By learning to control and change your thoughts. Feeding yourself thoughts that are motivating, picturing yourself being successful, and then taking the right actions. Many of us harbor negative thought patterns that lead to behaviors and habits that are self defeating or life threatening. If you continue to do what you’ve always done, you’ll always get what we have always gotten. Have you looked into learning hypnosis and NLP? Hypnosis and NLP teach you powerful, positive tools to help you control and change your thought patterns, and motivate you to get what you want in your life. Do you want to lose weight, stop smoking, reduce your stress, become more confident, sleep better, live a better life? You hold the key. CALL Inspire Hypnosis Today 530-387-6644 for a FREE screening session. 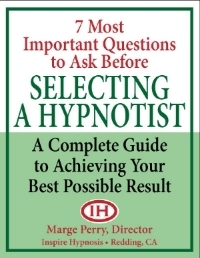 Marge Perry is a Master Hypnotist, NLP Trainer and NLP Life Coach. She has been helping her clients make positive changes using hypnosis and NLP strategies since 2002. I used to believe…if I stepped on a crack, I’d break my mother’s back; that the tooth fairy would leave money under my pillow in payment for lost teeth; and that in order to be successful in life, I had to go to college…WOW where did all these beliefs come from? Well, for a short time after my friend Laurie told me about the “crack belief’” I had a rather irregular gait as I walked, skipped and jumped over cracks on my way to Longfellow Elementary School. Eventually it happened…I accidentally stepped on a crack. I worried all day at school, and then rushed home expecting to find my mom withering in pain from a broken back that I caused!. To my surprise and relief she was cooking dinner and apparently pain free when I arrived home from school. Sometimes we struggle through life with beliefs that limit us; then something happens that questions that limiting belief, and our world opens up to a larger life with more choices and possibilities. Our beliefs are formed through personal experiences and what we learn from trusted people in our lives; parents, peers, teachers, mentors etc. We all have a multitude of beliefs that influence the way we conduct our lives. Some beliefs are directly related to our values and feed our spirits, while other beliefs are dated and actually limit our potential. Beliefs drive our thought patterns and influence our behaviors…Think about this for a moment…Imagine if you have a belief that triggered negative thoughts about your intelligence or your appearance, or your ability to land a good job? Those negative thoughts will influence your behaviors and will lead to a self fulfilling prophecy of what you believe to be true. If you believe you have the skills and the abilities to land a great job, you will place your focus on those personal assets that set you apart and that make you marketable. When your attitude is positive, you are more confident. With confidence comes motivation and persistence in taking right actions. It’s just a matter of time before you land our dream job.. If you believe that jobs are scarce, and you are competing against impossible odds with people more skilled then yourself…how motivating is that? How soon will it be before your negative self- talk and attitudes lead to giving up on what you want? Changing a limiting belief can be a quick & simple process. The result can be freeing and life changing. Your beliefs can be dream makers or dream takers…the choice is yours! You CAN change your mind and change your life with hypnosis! It’s Not So Much What You Eat… It’s What’s Eating You. Do you already know what to eat and how to exercise, but you just can’t seem to stick with it? Why is that? There is a fairly simple formula for maintaining a healthy weight and lifestyle. So why aren't we a society of Atlases and Athenas? North State, Redding, CA -- When we think of ninja, we think of the extreme martial arts combatant, or the humorous Ninja Turtles. We don't think of a hypnotist as being a ninja. 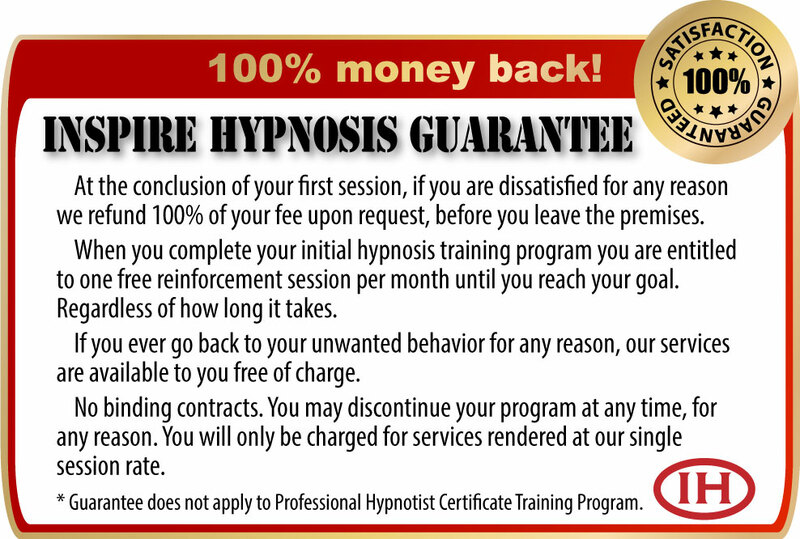 But providing quality hypnosis is very similar to the skills of the ninja fighter. 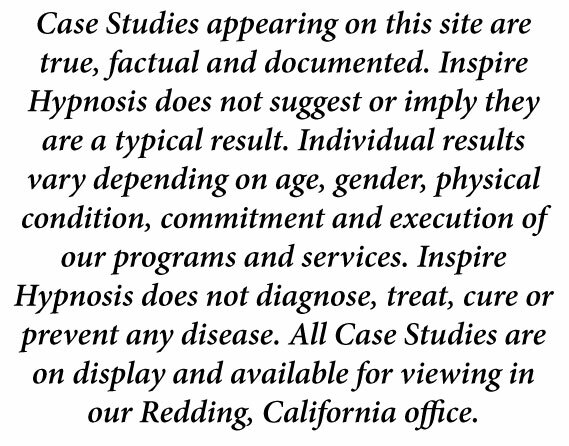 North State, Redding, CA -- Have you tried to lose weight before? Where you successful? Have you been on a "fad" diet? Bought weight loss gizmos and gadgets? Had low cal, styrofoam-tasting food delivered to your door? Or have you tried the many miracle weight loss formulas and pills available on the market? There are few things in life that we have more control over than what, when, where, why and how much we eat. Unless you are physically disabled and unable to do so, the act of walking is not a difficult task. When we combine sensible eating habits with the simple act of walking 20 minutes three to four times a week, losing weight is no longer impossible, but probable. NORTH STATE, Redding, California—Nothing is more stressful in life then the loss of a child. The second highest stress factor humans suffer is loss of a spouse. I've been thinking a lot about stress lately and how every unproductive human condition and emotion is worsened by crippling stress. I see it every day. NORTH STATE, REDDING, CA—When we envision hoarders, we see stacks of belongings strewn throughout the home, floor to ceiling with only narrow paths from room to room. Yet even hoarders take out the trash. Empty pop bottles, uneaten food, used coffee grounds. Trash gets emptied regularly. Life is an adventure. A long journey filled with happiness, sadness, struggles and success. The journey of life introduces us to many difficult situations. Worry is wasting today's time, cluttering up tomorrow's opportunities with yesterday's troubles. If you think too much and fail to take action, fear makes its home in your mind. Worrying tries to cross a bridge before you come to it. Worry is holding in your mind that which you don't want to happen. If you think it is and it isn't, it will become so even tho it isn't. 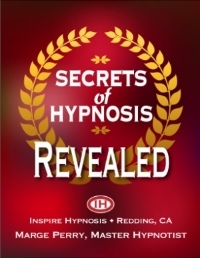 I've asked my good friend, Russell Yarnell, to share his amazing hypnosis story with you. How he attended a basic hypnosis training course for the purpose of improving his guitar playing. How that experience changed his life resulting in helping thousands of people lose weight, stop smoking and improve their lives. 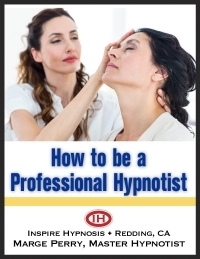 Most importantly, he changed the public perception of hypnosis at the time from hocus-pocus, voodoo, witchcraft, to the respected social sciences tool it has become today. click here to go to Inspire hypnosis surprise page #1.
click here to go to Inspire Hypnosis surprise page #2. Click here to go to inspire hypnosis surprise page #3. Click here to go to Inspire Hypnosis surprise page #4.